Suggested Readings — Your Choice to Live, Inc. Here are some books that we've found helpful! What's Wrong with My Kid? By: George E. Leary Jr.
A down-to-earth, judgement-free guide for parents on recognizing the warning signs of alcohol and drug use in their kids, and getting them the help they need to grow and flourish. "A powerful and beautiful story of the strength of a mother's faith, an inspiration for everyone, filled with hope and love." --Anne D. Meyer, past President of Nancy Reagan's National Family Partnership and drug strategy advisor to President George H.W. Bush "Just Keep Going is an insightful and practical devotional, showing the unwavering love of a mother and her journey through the pain of a son struggling with an addiction. Sarah's personal experience shows how you, too, can let go of regret and blame, holding onto the wisdom, strength and comfort of God's Word." --Pam DeRosa, President and co-founder of the InFormed Foundation (eating disorder education) and nationally-known author, speaker and radio show host "What lies between the covers of this book is the gut wrenching story of a mothers' love, anchored in a faith that challenges her reality of who God is and what He promises. Listen to Sarah's conversation with God as she battles for her son. This story belongs to me. It has been my reality." --Elizabeth Neary, nurse and the mother of a son in recovery from addiction "This book is powerful, encouraging and inspirational. You will be deeply touched by Sarah's determination to listen to God while going through circumstances that have devastated many families." --Sandi Lybert, co-founder of Your Choice. Sarah Nielsen is a wife and mother of three. As a parent speaker with Your Choice, a drug education, prevention and awareness program, she shares her knowledge and experience with students, parents and teachers. Sarah also manages a publishing company in Wisconsin. 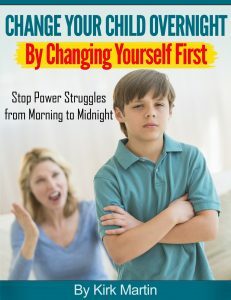 Change Your Child Overnight By Changing Yourself First applies the tried and true principles Martin and his team have taught parents for years. Change the approach, and the reception changes, too. WHY Do They Act That Way? : A Survival Guide to the Adolescent Brain for You and Your Teen by David Walsh, Ph. D.